Mr. Harris is an independent historian and a regular contributor to the History News Network. For more information see www.JamesThorntonHarris.com. 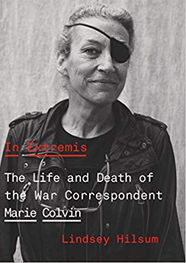 The conditions endured by journalists in war zones are portrayed in chilling detail in Lindsey Hilsum’s new book on war correspondent Marie Colvin. A staff reporter for The Sunday Times of London, Colvin died on February 22, 2012, aged 56, in Homs, Syria. The Syrian army, honing in on her satellite phone, targeted an artillery strike on the building where she was reporting from. She lost her left eye after getting hit by a rocket propelled grenade while covering the Tamil insurrection in Sri Lanka in 2001. She had been the first reporter in six years to report directly from the Tamil rebels’ besieged enclave on the island nation. International monitors estimated that more than 80,000 people had died from shelling, hunger and disease. Colvin’s near death at the hands of the Sri Lankan Army drew world attention to the slaughter which had been conducted in secret. Although Colvin died eight years ago, her career and tragic death have gained new attention with the publication of Hilsum’s book and a recent biopic, A Private War, starring Rosamund Pike. Marie Catherine Colvin grew up near Oyster Bay, Long Island, one of five children in a middle-class Irish Catholic family. Her father, an ex-Marine, was an English teacher in the New York city public schools. After graduation from Yale where she wrote for the campus newspaper, she went to work at UPI’s Washington Bureau. From her first days in the newsroom, she told her friends she wanted to emulate female journalists such as Martha Gellhorn, who had covered the Spanish Civil War, World War II and Vietnam and Oriana Fallaci, who covered the Middle East and obtained candid interviews with world leaders including Henry Kissinger, Deng Xiaoping and Lech Walesa. As a young war correspondent in the 1980s, Colvin’s looks and manner were a magnet for men including those in power. In 1986 she was the first reporter to interview Muammar Gaddafi after the U.S. air strikes on Libya. A dozen other western correspondents had traveled to Tripoli to see the “supreme leader,” but he chose Colvin for an exclusive sit-down discussion. Later, she became one of the few western reporters allowed to travel privately with PLO leader Yasser Arafat. He granted her a number of interviews and cooperated in a BBC documentary she produced about him (to the irritation of the Israeli government). From her base in London, Colvin covered the wars in Kosovo, Sierra Leone and Chechnya. At one point, traveling with Chechen rebels and cut-off by Russian Forces, she hiked 40 miles in snow over Caucasian Mountain, subsisting on canned milk and crackers, finally reaching safety in the Republic of Georgia. Author Lindsey Hilsum, writing her own first-hand knowledge of war zones, weaves a compelling story. Hilsum, currently serving as the international editor for Channel 4 News in Britain, has covered conflicts in Ukraine, Syria, Iraq and Kosovo. She knew Colvin socially and worked alongside her in Syria. In researching this book, she gained the cooperation of Colvin’s family, and had access to the reporter’s personal diaries and notebooks. The result is a deeply moving, very personal biography. Colvin was as adventurous in her love life as she was in her reporting. She was married three times and had numerous, stormy love affairs. She tried twice unsuccessfully to conceive a child. Several of her lovers openly betrayed her, leaving her humiliated and deeply depressed for long periods of time. Her difficult emotional life was exacerbated at times by an increasing dependence on alcohol. She tried on several occasions to stop drinking but was never successful. Despite her high alcohol intake, she was an empathetic interviewer and a skilled writer with a keen eye for detail. She rarely missed a deadline even writing under fire. Colvin rose to fame during the 1990s, before the rise of the Internet. During that time, she competed primarily with print journalists and television reporters from CNN and other international outlets. She covered the Egyptian revolution of 2011 from Tahrir Square and noted the new importance of social media in rallying opposition to authoritarian governments. She continued to believe in the importance of print journalists going out to the battle-zone, conducting interviews and presenting compelling stories to British and American readers. As avid consumers of news, we often take the difficult work of journalists for granted. The murder of Jamal Khashoggi briefly focused attention on the dangers faced by reporters working in hostile environments. In Extremis is an instructive look at the motivations and operating methods of these men and women. Readers will come away with a deeper understanding of the brutality of modern dictatorships and an appreciation for an amazing woman whose life was cut short trying to present us with the truth.